As everyone knows, President Donald Trump has a truly strange way of engaging with the Russians, especially after a cyber attack to compromise a democratic election in the United States. Trump however, thinks he is following foreign policy protocol of past Oval Offices and Senator Rand Paul, currently in Moscow for a diplomatic trip, invoked support with references to the Cuban Missile Crisis. So the question arises: Is Trump following historical precedent? In recent tweets defending his soft stance on Russia, Trump tweeted that “I am conducting diplomacy”, and has said countless times that he, unlike other presidents, will fix the U.S.-Russia discord. 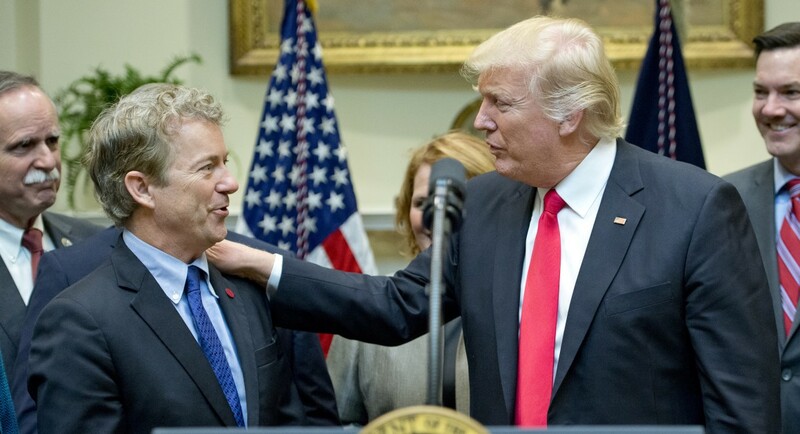 Kentucky Senator Rand Paul would also defend Trump by saying that during the Cuban Missile Crisis, there was constant communications and diplomatic relations with the Soviet Union, despite Cold War tensions reaching their apex at that particular time. He uses that historical fact as a reason of support for what Trump did in Helsinki. This video address on Youtube was filled with inaccuracies. Paul chides the hawks on both sides of the aisle for opposing Trump’s Russia stance. So getting concerned with Russia hacking a sovereign election and antagonizing the United States while conducting itself domestically and internationally in unsavory ways is hawkish? In other words, Paul thinks standing up for American security, otherwise patriotic, is now “hawkish”. Also, “hawkish” is a bit of a strong word to use as no one is calling for war with Russia or other hot escalations of rhetoric. Paul advocates against isolationism, when he is actually justifying isolationism by saying that Trump should not take a hard line on Russia for their corrupt actions. Rather, Trump should forget all of that and instead engage in talks to heal relations. The most absurd claim of all was when the Senator said that politics viewed as a “team sport” delivers great harm. Be that as it may, the brutal naivete should make one glad that Rand Paul is not President over Trump, considering that the Cold War, both World Wars, and even modern-day pol-mil conflicts rest on the inevitable concept of “team sport” politics. The comparison of the Cuban Missile Crisis and Russian hacking in 2016 is difficult to begin with, as the Cuban Missile Crisis was about nuclear warfare possibilities while this is verified and proven cyber warfare, albeit one-sided. Even narrowly however, the comparisons do not hold. As the situation unfolded, President Kennedy called three ex-Presidents and informed them of the situation. President Trump, even with the information that is available on the Russian hacking during the 2016 election, appears to not have called either President Carter, H.W. Bush, Clinton, Bush, or Obama. Kennedy also called Downing Street and informed the British Government. There is no sign Trump has called Prime Minister May about Russian hacking. When the Cuban crisis began, former Secretary of State Dean Acheson, also an advisor to Kennedy regarding the crisis, went to French President Charles de Gaulle to give an update. Trump has not sent Condoleezza Rice to meet Emmanuel Macron. In fact, how can Trump call any former President or any Prime Minister about this when Trump himself refuses to accept his own intelligence reports that conclude that the Russian Government was involved in the hacks? To make matters even worse, Trump displays clear delusion and confusion about Russian hacking, as he first blamed the Obama Administration for not doing anything about the Russian interference, only to then claim that the interference was a hoax and the U.S. Intelligence Community has it incorrect. Not to mention that Trump was the one who called the election “rigged” the month before it took place and Senate Majority Leader McConnell refused to take part in a statement notifying the American people about this happening. Blaming the Obama Administration holds no water. 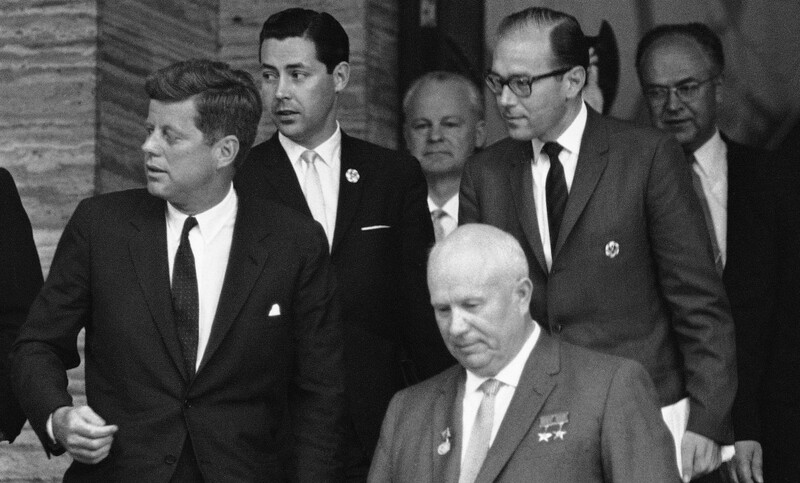 It is true that even on the third day of the Crisis, the Soviet Foreign Minister met with Kennedy at the White House and then-Attorney General Robert Kennedy met with the Soviet Ambassador to the United States down the road at their embassy (their home turf). However, while letters were going back and forth between President Kennedy and Soviet Union Secretary Nikita Khrushchev, Kennedy put together an executive committee of top diplomats and cabinet members often known as “EXCOMM”. This included Defense, State, U.N. Mission, and ex-State as well. The EXCOMM would deliberate a course of action and how to counter the missiles placed by the USSR in Cuba. This was no secret and the press knew this team was assembled. As the crisis continued, U.N. 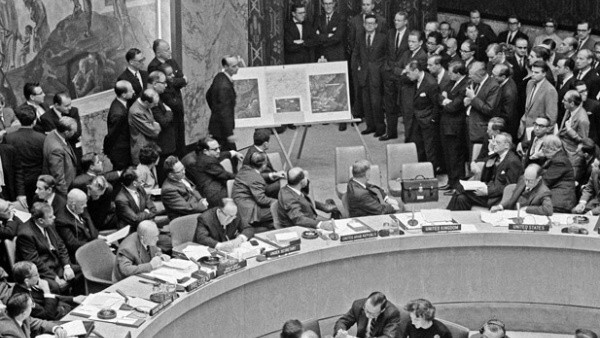 Ambassador Adlai Stevenson brought up the missiles in Cuba at the U.N. floor. Across the room, the Soviet Union refused to admit that they had placed the missiles, but Stevenson came prepared with enlarged photos which the United States put on display for everyone to see. It was then clear to the world that the Soviet Union was ready to attack the United States. Stevenson presents the evidence (Council on Foreign Relations). The current U.N. Ambassador, Nikki Haley (who came into the job with zero U.S. State Department experience unlike liberal icon Adlai Stevenson), has not spent a day at the U.N. Security Council with intelligence briefs containing verified information regarding Russia attacking the United States’ electoral process. She has not brought in enlarged copies of leaked emails of the Democratic National Committee (DNC) and Clinton campaign officials such as Neera Tanden or John Podesta for anyone on the Security Council to look at. To compare Nikki Haley to the late Adlai Stevenson would be an insult to Stevenson in and of itself, but the comparison looks even worse when Haley’s lack of action on Russia’s meddling in America’s domestic affairs comes to light, the latter of which may not be her fault, truth be told. Haley did announce that the U.S. was going to impose sanctions on Russia, but that was due to Russia’s support of Bashar Al-Assad and Syria’s chemical weapons program, not election meddling. Trump would also scrap those sanctions altogether. At any rate, Russia’s interference should be discussed at the United Nations with other nations. Haley is not the only Administration official who appears to do little. President Kennedy gave an address to the nation regarding the Cuban Missile Crisis. Trump has been in office for a year and half now and has not given a single address on the matter. Trump barely does press conferences about anything. If Donald Trump has an “EXCOMM” of his own working on a strategy with Russia and cyber-attacks , it is not open information and remains highly doubtful. Secretary of Defense James Mattis has also tried to weaken sanctions against Russia, although he has slammed Russia publicly on their foreign policy, but made no remarks regarding Russian interference even though it is well-established that Russia attempted some level of it. Secretary of State and former CIA Director Mike Pompeo recently testified in Congress saying that the United States will not accept Crimea as a part of Russia, which is certainly a positive sign for the Administration. However, Pompeo would offer no details as to what was discussed in private meetings between Trump and Putin, nor did he offer any retaliation considerations for Russian election-interference either. Luckily, Pompeo did say that Trump now accepts the intelligence reports on Russia’s related actions. National Security Advisor John Bolton also said there would be no Trump-Putin meeting until the Mueller investigation was over. Rand Paul is making things awkward by inviting Russians to Washington, despite Bolton’s announcement and the Mueller investigation. For whatever reason, Paul believes that engaging with Russian Government officials, despite their clearly insidious intentions, will bring Americans progress. Even the Trump Administration is against Paul on this. 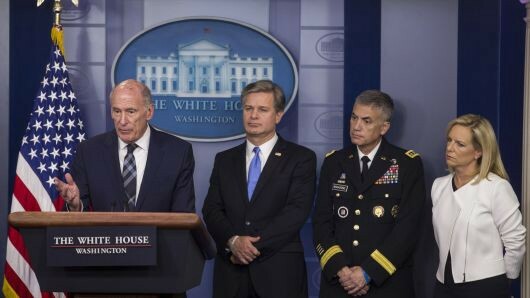 After finding out that Russians were still trying to hack into the United States during the 2018 election cycle, a White House briefing was held with several intelligence officials on what was being done to prevent the events of 2016 from happening again and maintaining the “integrity” of the upcoming election. These are significant improvements for the administration. But there was a noticeable absence in the briefing: Donald Trump himself. Trump Administration members at a recent White House Press Briefing (CNBC). Again, none of these are proper, palpable responses or a set of actual initiatives which would change U.S. direction on Russia, especially when it comes to diplomatic relations or retribution. It is unclear what Trump and Putin talk about when they meet. Trump’s defenders will argue that Trump has not done anything on his own regarding Russia’s interference because that is the job of the Mueller investigation at the Justice Department. Only after those findings are conclusive can Trump move forward. That would be an acceptable defense, except Trump constantly criticizes the Russian investigation, Robert Mueller, Rod Rosenstein, and nearly every day tweets “no collusion” or “Russia hoax” or something along those lines. Not to mention, former Vice President Joe Biden believes this White House is doing nothing about what took place in 2016, so it can be assumed that Biden thinks that some activity could have taken place despite the pending investigation. However, Trump was the one who appointed Mueller to the position, and the Administration investigating Russia themselves would lead to a massive conflict of interest (although Trump has enough conflict of interest scandals already brewing), given Trump’s own election victory and his potential role in corrupt behavior. The President cannot investigate himself! Perhaps the reason Trump shows little interest in doing something about Russia is because he is indeed guilty of collusion and he knows getting to the bottom of it would spell out deep trouble for him and the Administration. His constant opposition against Mueller and due process of the cyber crimes committed are not characteristics of an innocent person. Neither is his well-established interest in firing Robert Mueller or Rod Rosenstein. Foreign affairs expert Max Boot already contends that at this point, Trump may not be guilty of collusion, but the evidence already exists which make it look like at least some misconduct took place during the election. In other words, it would be incredibly surprising if Trump or his inner circle walk away cleanly. It appears that maybe Republicans in the House are afraid of Trump and his crew’s complicity, and they have begun impeachment proceedings against Rod Rosenstein in what appears to be an attempt to change outlook for the Mueller investigation so Trump may be cleared. Perhaps Trump knows he is innocent (and he may be), but both Trump and House Republicans’ opposition to uncovering Russian interference is because doing so delegitimizes the G.O.P. win during the Presidential election, something the ego of Trump nor the Republican Party is ready to bear. Trump already lost the popular vote by roughly 3 million votes, and now this? It may also be to simply protect Trump and the Republican Party image, afraid of what may possibly be exposed and how that would change the trajectory of the upcoming years. The end of the Cuban Missile Crisis took form when Khrushchev himself offered to remove the missiles from Cuba in exchange for the U.S. not invading Cuba. Fidel Castro himself wanted the Soviets to strike with a nuclear attack if the United States were to ever invade, and Khrushchev appears to have attempted to calm both sides down. Eventually, Moscow would demand tougher terms and both parties de-escalated as Kennedy would accept a follow a “non-invasion” pledge. That was not the end of U.S.-Soviet negotiations. The U.S.S.R. knew that the United States had Jupiter missiles in Turkey, which could have hypothetically been launched towards Russia. Given that this was the closest both sides had ever gotten to a nuclear showdown, both sides realized the possible ramifications and had the enthusiasm to drive through a Partial Nuclear Test Ban Treaty, with the U.S., U.K., and Soviet Union all ratified after nearly a decade of stalled talks. The treaty was signed less than a year after the Cuban Missile Crisis had ended. It was a model example of Cold War diplomacy, as President Kennedy ratcheted down the Cold War tensions after sharply raising them and playing along. 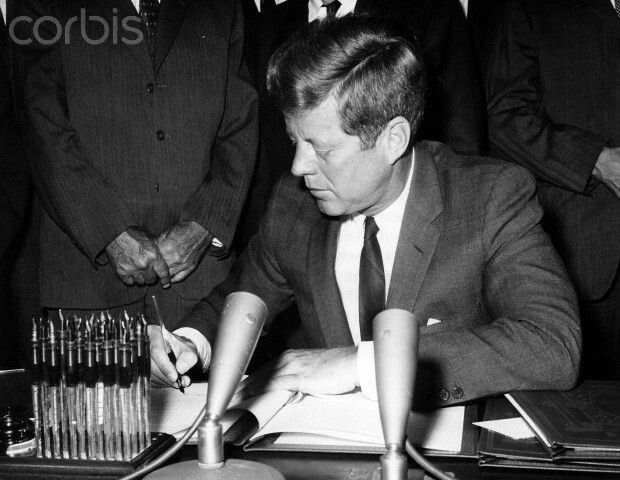 President Kennedy signs the Partial Nuclear Test Ban Treaty (Pinterest). This was punctuated further with the United States removing their obsolete missiles out of Turkey by April of 1963, which was allegedly Ambassador Stevenson’s idea early on, in order to prevent nuclear war at all costs. President Kennedy would eventually accept the idea and the treaty was ratified a few months later. A hotline was created between the two countries, and so the Senator from Kentucky had that part right. Interestingly enough (given current political rumors), Stevenson was offered financial assistance by the Soviets if he were to run for President, but turned it down and found it highly immoral and even reported it to President Eisenhower. Yet it was Stevenson of all people who helped prevent nuclear war with the Soviets many years later. But even for the modern day, the Cuban Missile Crisis does provide some important lessons, and Paul is admirable for bringing it up in that regard. The Cuban Missile Crisis was proof that prior state visits do not always guarantee avoidance of conflict, as Kennedy and Khrushchev had met just the year prior. President Trump’s meetings with Putin and other leaders does not guarantee cooperation from Russia or other hostile nations. In a normal administration, Putin’s behavior in Syria or in Ukraine would perpetuate serious tensions. Trump should also find President Rodrigo Duterte’s behavior terribly alarming as well, and should perhaps do something about it despite meeting Duterte at the Asia summit last winter. 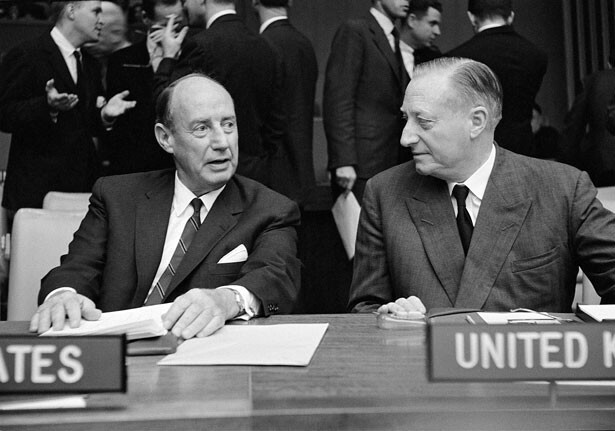 Ambassador Adlai Stevenson at his United Nations seat chatting with the British Ambassador (legal.UN.org). What is also notable about the Cuban Missile Crisis is that at the time, some may have looked at Stevenson’s plan (in the EXCOMM room) and Kennedy’s signature on the nuclear treaty (among the general public) and found it to be too isolationist and not adequately hawkish. But it is important to remember that both Kennedy and Johnson maintained a presence in Vietnam after the Cuban Missile Crisis, in what would escalate to full-involvement in the Vietnam War. Despite entering a peaceful agreement with Britain and the Soviet Union, the Cold War would still continue for almost thirty years. 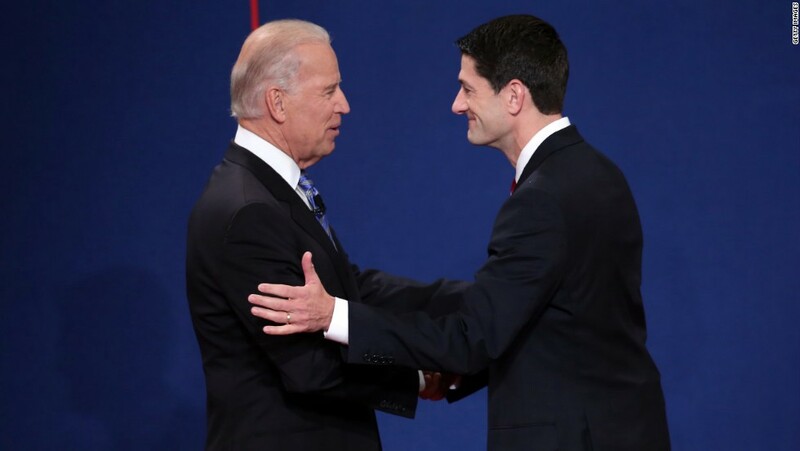 The phrase “you’re no Jack Kennedy” has now been used in two Vice Presidential Debates: once by Lloyd Bentsen to Dan Quayle in 1988 and Joe Biden to Paul Ryan in 2012. The same can be said to Donald Trump. In the aftermath of the Presidential Election, Trump could have gone to Putin and both countries could have signed a “no-interference pledge” signed by both the United States and Russia vowing to not get involved in each other’s affairs. Other than the embassy and consulates, Russia has already banned American government activity in the country. In fact, Russia ordered the closing of the U.S. Consulate in St. Petersburg earlier this year. It appears Trump has not sought such a pledge. 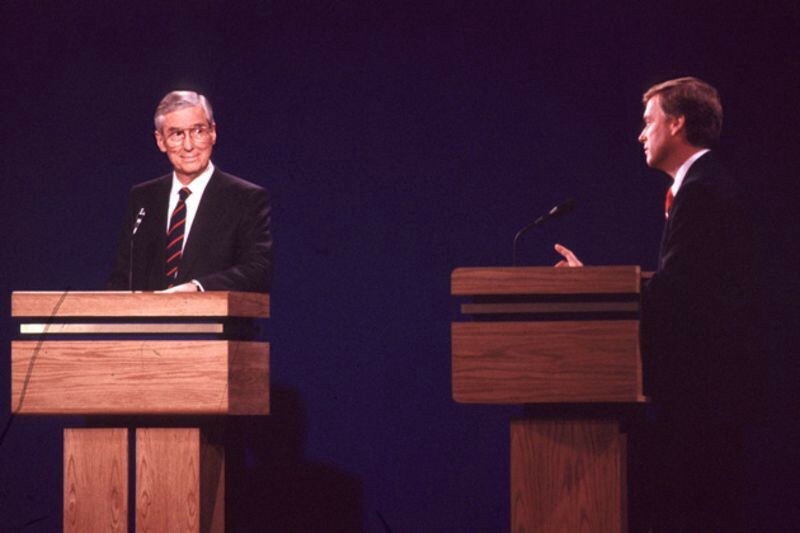 Vice Presidential Debates, 1988 and 2012 (Bloomberg/CNN). Trump could have also engaged with Putin in signing on to a cybersecurity treaty, not just for election interference but an agreement to avoid cyber attacks and hackings in general. Russians have also breached American banks in 2017, and the Russian Government is often instigating these attacks, not just towards the United States, but other European nations. Both countries, alongside possibly Britain, Germany, France, and others could have pledged to not hack into each other’s banking systems, private and government emails, and other sensitive information, such as U.S. Social Security or intelligence databases. E.U. states have motive to enter such a treaty, because Russians have also tried to compromise elections in Europe as well. China, Trump’s number one foe, is perhaps the most guilty of cyber breaches against the United States, targeting Google and Lockheed Martin back in 2015. In 2018, Chinese hackers once again targeted American defense contractors and engineering firms involved in the South China Sea. Both attacks have been linked to the Chinese Government. Trump also could have also engaged with his new friends, the North Koreans, to stop hacking the United States, after they allegedly hacked Sony back in 2014, almost derailing the film The Interview. In June of 2018, the Department of Homeland Security reported that the North Korean Government was maliciously attacking the United States in cyberspace. Trump, who claims to be a brilliant negotiator, could have made China and North Korea parties to a cybersecurity pact with Russia or sign separate treaties with the P.R.C. and the D.P.R.K., but has done neither. Donald or the next president can still do such a pact, and if Trump comes through with both a “non-political interference pledge” and a cybersecurity treaty or both, then Senator Paul would be correct that Trump is following Cuban Missile Crisis protocol and communication strategies. Either of those things would have been great for the United States. There is no guarantee that these countries would have agreed to sign on or stay through the end, but good faith efforts matter. As for staying engaged with Russia-related matters, as Kennedy and Johnson did with Vietnam and the Cold War, Trump could have at least done that by staying involved in Syria or potentially even covertly collaborating with Russia to fight ISIS, something that would have increased American importance in the Syrian Civil War. Unfortunately, Trump is doing the opposite, saying and doing nothing regarding Russia and Syria violating ceasefires and Russian bombs continue to drop on Syrian Rebels and civilians. Trump is constantly debating pulling out of Syria, despite ISIS’ looming presence and the ultimate betrayal that would be inflicted upon moderate Syrian Kurds, who would be left to be devoured by ISIS, the Al-Qaeda-backed Syrian Rebels, and the Kurds are now reaching out to the Syria-Russia-Iran alliance. Striking Assad now is a reckless move by the United States, but having their Kurdish allies seek the assistance of the Assad Regime, after the Kurds and the Syrian government have fought militarily for years, speaks volumes about Trump’s leadership. On July 25th of this year, ISIS conducted one of its deadliest attacks in Syria, bombing civilians in an open market. The fight against ISIS is clearly not over, but with Trump’s lack of direction, the Syrian Government, already hands bloodied in their brutality, can now heal their image by taking the lead on fighting ISIL instead and help the Syrian Kurds fight Turkey. Trump promised to defeat ISIS- the American people are still waiting. Of course that became much harder when his own White House staff recommended continuing the Obama plan. Since Trump cannot accept anything Obama did, what will Trump do now?! Kennedy kept the pressure up against the Soviets by having missiles in Turkey. Trump can maintain pressure on the Russian Federation by having the U.S. Military and NATO stack up at the Lithuanian-Russian border, like his predecessor once did. Trump shows no interest, as he could have re-affirmed Obama’s commitment to protect Lithuania so that it does not get annexed by Russia like Crimea (Lithuania was once annexed by the Soviet Union and remained in Soviet control for nearly fifty years). He also shows no concern for Latvia and Estonia, NATO allies currently being threatened by Russia. In fact, Trump is an opponent of NATO, the institution President Obama used to bring allies together. When the President is against NATO itself, America’s foreign policy agenda is severely undermined from the start. Despite the plausible argument that Trump is hogtied in directing direct responses to Russia due to the Mueller investigation, the President still could have played ball in Syria and Eastern Europe. What made the Cold War complicated and perplexing was while both sides did have diplomatic negotiations and communications like Rand Paul asserted, there were always things going on behind the scenes, like assisting allies discreetly, selling armaments to allies, proxy wars, trying to gain an edge on spillover Cold War conflicts taking place, and economic ideology battles. Trump wants to bring back the old America, but the old America had a role in the world, sometimes too much of one. Now there is very little of a role at all. Needless to say, Donald Trump’s definition of diplomacy, the one he swears on Twitter he is conducting, is very different from John F. Kennedy’s definition of diplomacy. Kennedy believed in the NATO alliance, as seen during the Cuban Missile Crisis. Trump despises NATO. Kennedy’s White House got to work on agreements in writing. Trump’s White House has not. If Trump goes on to significantly improve bilateral relations and Russia stops interfering, then Rand Paul, usually knowledgeable on foreign policy, would be vindicated. Until that happens, it is safe to say he is fundamentally misinterpreting the situation, and Trump is not following Cuban Missile Crisis precedent. Time will tell if he will eventually opt for a similar strategy, especially if the Mueller investigation ends and 2020 is closer. As of right now, it does not appear that will happen. Special thank you to Stuart Kaufman, Professor of Political Science & International Relations, University of Delaware, and Director of the Russia, Ukraine, and Eurasia section for the White House National Security Council during the Clinton Administration. Writer. Entrepreneur. Guest columnist at News Journal/DelawareOnline. Mostly write on politics, economics, and sometimes TV & movies.